The Classic EFK is a new spin on an "Old School" American Angler Fillet Knife. This knife offers the classic style handset with a high performance motor and gear system that provides optimum blade speed and precision cutting. The Classic EFK features a state-of-the-art vent design that minimizes heat build-up and comes with a convenient carrying bag that allows proper venting to prevent odor and corrosion build-up. 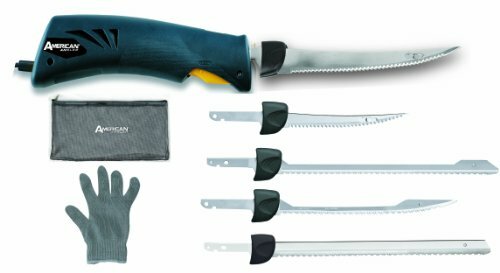 Includes 5.5" Freshwater Blade, 8" Freshwater Blade, 10" Freshwater Blade, 8" Saltwater Blade, 10" Saltwater Blade, Mesh Glove, Handset, and Carrying Bag. Fillet with Ease: The Classic Series motor boasts 1.5X more torque than any other "Heavy-Duty" EFK so big bones never slow you down. Fillet Comfortably: Advanced airflow design keeps the Classic Series ergonomic handset cool for hours of continuous filleting. Fillet to Perfection: The EFK Classic series handset is compatible with all variations of American Angler Replacement Blades including the 8-Inch Curved Replacement Blade (31010DS) and the 8-Inch Curved Replacement Shark Blade (31018DS) so you always have the perfect blade to fillet your catch. Fillet like a PRO: Commercial Fisherman and Guide Services choose American Angler more than any other Brand. Backed by a 1-Year Limited Warranty.